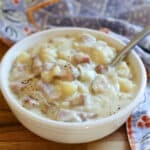 Creamy potato soup with soft chunks of buttery potatoes and salty sweet ham is perfect with a salad on the side or just some crusty bread. This recipe is so over-the-top simple, it’s hardly a recipe. However, awesome ways to use our leftovers make my heart go pitter-pat, so I’m sharing this soup with you today. I spent less than 5 minutes working on this meal and when we were ready to eat all I needed to do was scoop and serve. That is my favorite kind of easy dinner! I was staring into the refrigerator over the weekend and I really didn’t feel like warming up another plate of leftovers. (This is what tends to happen when you accidentally wind up with triple the amount of ham and potatoes as your family could possible eat!) 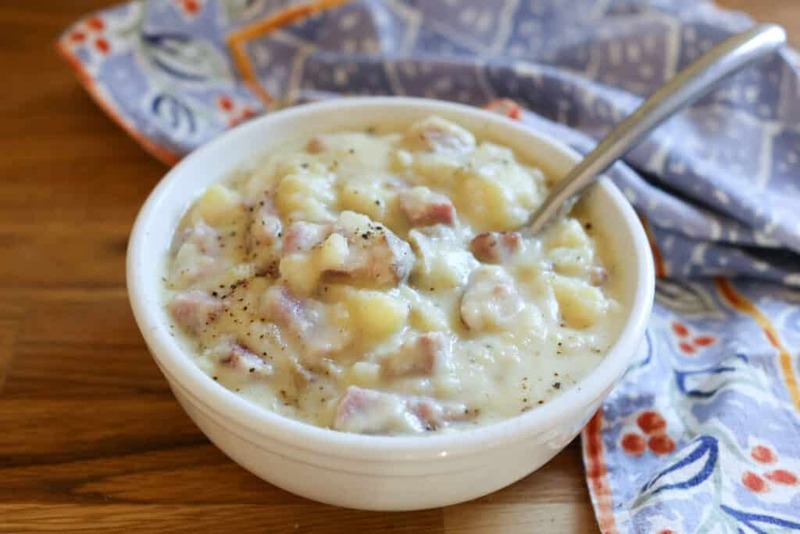 I saw the container (okay, technically, it was pretty much a vat) of potatoes and a big package of ham and decided to see if I could improvise with what we had and come up with a new Baked Potato Soup. Unlike a few other recent recipe attempts, this improvised soup turned out fabulously and there was hardly a bite leftover! 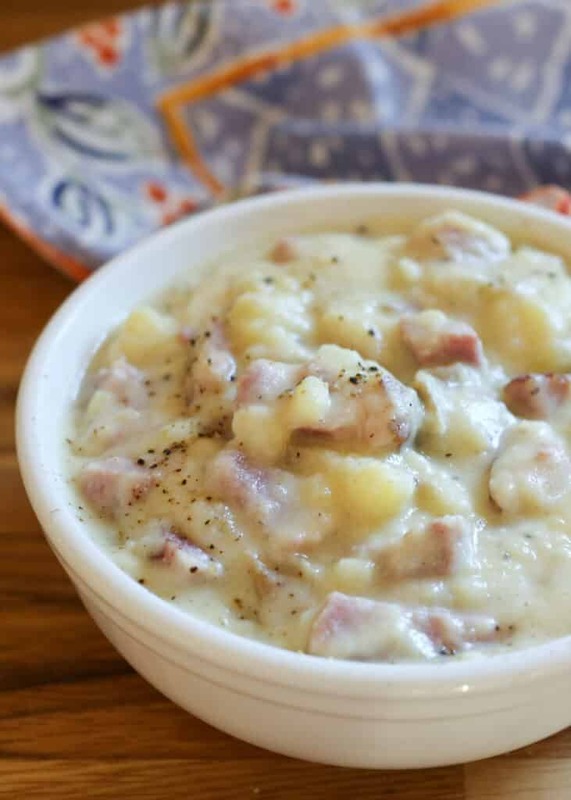 Combine the potatoes and ham in the crock-pot. Pour enough milk into the crock-pot to almost cover them. Stir or smash with a heavy spoon to combine. Cover with lid and cook on LOW for 4 hours or HIGH for 2 hours. 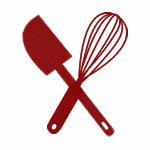 Stir and lightly smash any large chunks of potato. Season generously with salt and pepper, taste and adjust as needed. Cover again and cook for 1-3 more hours on LOW. Add more milk as desired to thin the soup to your desired thickness. Serve with crusty bread for dipping. Enjoy! Generous seasoning is crucial in simple recipes like this one. How much salt you need will be dependent on both how salty your ham is and how salted the potatoes are. Start with about a teaspoon and continue stirring, salting, and tasting the soup until it tastes perfect. I added almost 2 teaspoons of salt to our soup. My dad sends me a giant ham every December, so I am filing this away...looks so comforting! I have a freezer full of ham - definitely bookmarking this recipe!! This will be great the next cold rainy day, I'd love to walk in and smell this already cooking. I would add some onions! what about like half and half instead? I'm sure it would be delicious with half and half. Enjoy! I'm fairly certain that I used red potatoes for the soup. However, in my experience, most potatoes will become "gluey" if over-cooked. Keep an eye on the soup and make sure you aren't cooking it for too long. Enjoy! I did this exactly of the recipe but it never thickened. Am I missing something? I'm so sorry to hear that it didn't work out for you, Robinz. It is possible that your mashed potatoes may have simply had more liquid in them. It's hard to guess without actually being in your kitchen. When I smash the potatoes, I leave small chunks throughout the soup. I hope that helps! Could I incorporate the ham bone in w/ this somehow? Sure. You could add the hambone after smashing the potatoes and let it cook along with the rest of the ingredients. Remove it before servings. Enjoy!